Lately I have had quite a few people email me for tide pool information. As a result, I have decided to create a resource for people looking for some good Orange County tide pool information. This is by no means a comprehensive list, so if you know of somewhere special that I missed, please shoot me an email or post a comment and I will be happy to add it. Orange County beaches are always great places to find educational family fun. Remember, these tide pools are very fragile ecosystems and nothing should be removed or destroyed. If you see anyone doing anything that they shouldn’t, don’t be afraid to speak up. And if you see any trash in the area, pack it out. The starfish will thank you. This state park is one of California’s gems. There are some wonderful tide pools and many volunteer lead tide pool walks (view their calendar for details by clicking on the calendar icon on this website). Crystal Cove is a great place to take out-of-towners because the beach is pristine and reminiscent of California beaches of yesteryear. Plus there is a restaurant on the sand and a shake shack up at the top of the hill on PCH. I LOVE THIS BEACH. There is parking on the south end of the park on the ocean side of the highway, and on the inland side of the highway at the more popular (ie: near food) north entrance. Both spots are great places to park and head towards the tide pools which are in the middle of the stretch of beach belonging to the park. This beach is located on Pacific Coast Highway between Laguna Beach and Corona Del Mar. Good directions can be found by typing the words “crystal cove” into Google Maps. This is my favorite OC beach for tide pooling. This beach is not commonly known by tourists (which means it isn’t usually crowded with people) and it has my favorite tide pools in the region. I have seen more diversity of tide pool animal life here than anywhere else in Orange County. Little Corona Del Mar Beach is located in Corona Del Mar at the corner of Ocean Blvd and Poppy Avenue. You park in the residential neighborhood above the beach (and oh what a neighborhood it is!) and then walk down the path to the beach. There are restrooms located halfway down the path. 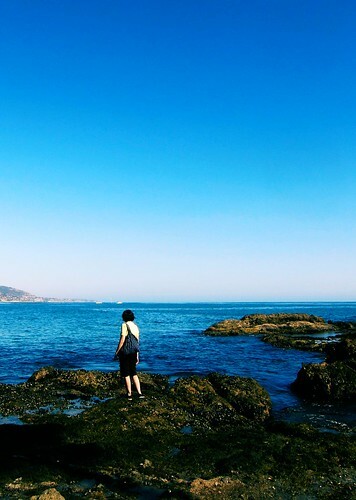 This tide pool spot is a great one for visitors of Laguna Beach to explore. I have heard from a couple different people that the occasional octopus can be spotted in this area though I have yet to see one. Nevertheless, its a beautiful spot and a nice place to stroll the shops, play in the surf, and search for crabs and sea stars. Main Beach is located where Laguna Canyon Road meets PCH and Heisler Park and the tide pools are just a 10 minute stroll north up the sand. If you type “Heisler Park Laguna Beach” into Google Maps, you will get accurate directions. This local spot is popular with divers, snorkelers, and tide poolers. There are no bathroom facilities here so make sure you have emptied your bladder before heading down. There is access to this spot at Fairview Street and Cliff Drive. A stairway off Cliff Drive leads down to the cove. Here are good directions. You don’t want to head to the beach to explore tide pools without checking the tide tables. Nothing is more disappointing than arriving at a tide pool only to find it under water! Here is the online tide table that I use. Follow the San Clemente, Newport Bay Entrance at Corona Del Mar, or Balboa Pier times depending on what beach you are visiting. Its important to know what you are looking at when exploring tide pools and the Doheny State Beach website has a great printable identification pamphlet. Everything from limpets to purple sea urchins can be indentified using this handy dandy resource. Print out a copy and bring it with you as you explore the tide pools. 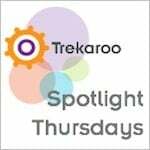 This post is participating in Trekaroo’s Spotlight Thursday. Click here and see who else has joined in on the fun! Oh, to live near the ocean! Thanks for sharing with us land-locked Midwesterners! Seriously Shar you are making me ache for California. Darn it for being so expensive to live. Can you make a post about househunting in non-expensive places in CA that are still fun to live in....in southern CA? Do such places exist??? Love it! Thanks for the tidepooling info! !